Manually configuring a Polycom SoundPoint IP 320, 321, 330, 331, 450, 550, 560, 650, 670 and SoundStation IP 6000, 7000 with VirtualTone Service. The preferred method to configure a Polycom Phone is via VirtualTone Provisioning purchased from VirtualTone. You can however follow this guide to manually configure your phone. 1. Start up the phone and identify its IP Address – using the menu key on the phone, go to the “Status” option, then to the “Network” option, and select the “TCP/IP Parameters” option. For this example we will assume the IP Address of the phone is 10.0.0.108, and the IP Address of the VirtualTone System is 10.0.0.11.
a. Set the “Display Name” field to the name you want to appear on the Phone display. b. Set the “Address” field to the extension number you want to associate with this phone. c. Set the “Auth User ID” field to the extension’s Authentication ID. d. Set the “Auth Password” field to the extension’s Authentication Password. a. 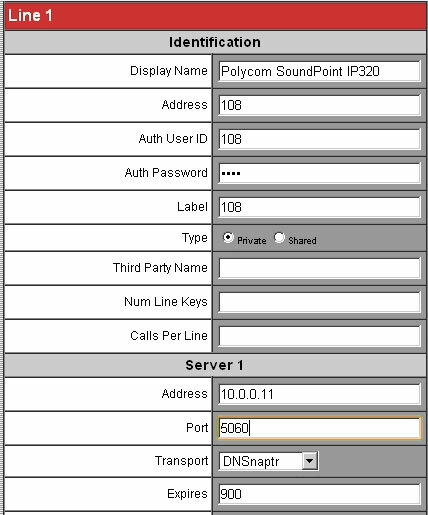 Set the “Address” field to the IP Address of your VirtualTone Phone System – in this example, 10.0.0.11. 6. In the “Local Settings” section of the “SIP” page, set the “Digitmap” field to blank by removing all the contents. 7. Click the “Submit” button at the bottom of the page. Your phone will restart. After rebooting, the phone will register with your VirtualTone Phone System. This can be verified by dialing "*97" then pick up the handset. You should hear enter your password.